Super Fresh Cucumber Salad is a cold, crunchy, juicy mix of flavorful vegetables topped with a simple red wine and oregano vinaigrette. Prepare the vinaigrette first to let the flavors blend as you prepare the rest of the salad. In a small bowl whisk together the olive oil, red wine vinegar, lemon juice, oregano, salt, and some freshly cracked pepper. Set the dressing aside. Peel the cucumbers if desired. Dice the cucumbers, tomatoes, and bell pepper. Thinly slice the red onion*. Pull the parsley leaves from their stems, then give them a rough chop. Crumble the feta cheese. 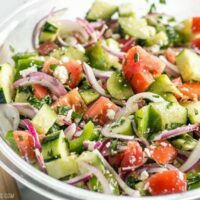 Place the cucumbers, tomatoes, bell pepper, red onion, parsley, and feta in a large bowl. Pour the dressing over top, and toss to combine. Serve immediately or refrigerate until ready to eat. This salad holds up well over a few days in the refrigerator. Be sure to stir briefly to redistribute the flavors before serving. *To take the harsh bite out of the red onion, be sure to slice them very thinly and soak them in a bowl of ice water for 5-10 minutes before draining and adding them to the salad.